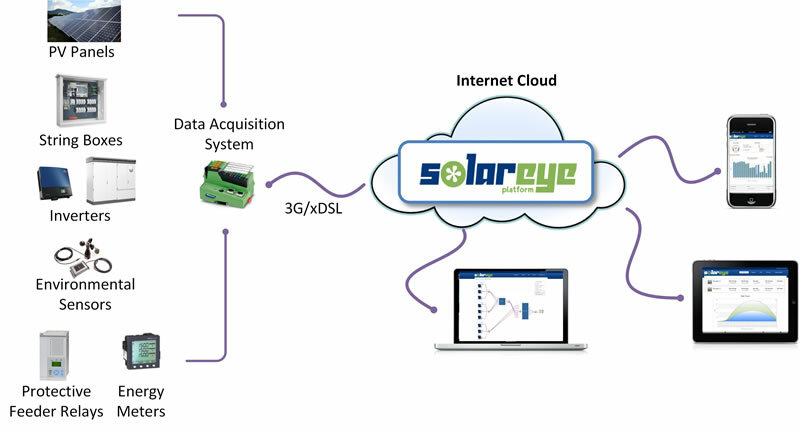 The SolarEye Platform is a high-performance, enterprise-scale, Web 2.0 platform that is based on an extensible and component-based MVC (Model-View-Controller) architecture. It is able to provide real-time services and energy analytics for the optimal operation and maintenance of thousands of PV installations. ensuring interoperability with major inverter manufacturers. Data connection (e.g. ADSL or GPRS/3G) is required at each PV installation for sending information to the SolarEye Platform servers. No extra equipment is required when a compatible data logger is already installed.